Falling aluminum prices over the last month have given rise to some asking if aluminum is now on a prolonged downward trend. Tempting as it is to look at day-to-day movements, a more holistic analysis suggests otherwise. As a recent Reuters article suggests, April saw the Rusal-related sanctions effect lift prices dramatically. The supply market went into shock at the prospect of 6% of the Western world’s capacity being denied to the market by U.S. sanctions on Oleg Deripaska, blocking consumption of Rusal aluminum primary metal. The resulting scramble for supply caused massive price inflation for those that could get metal. Some processors caught out to the point of reduced supply for the late second and early third quarters. A backtrack by the U.S. eased concerns and action by Deripaska to exit or relinquish control of En+, Rusal’s largest shareholder, have further eased concern. Gradually, the price has unwound and at current levels is a whisker over its low point in April. Aluminum’s slide is part of a wider base metals retreat in the face of a stronger dollar, plus macro concerns about trade wars and a cooling Chinese economy. One metric that commentators sometimes consider at a basic level is inventory levels. Falling global or exchange inventory is indicative of demand exceeding supply. 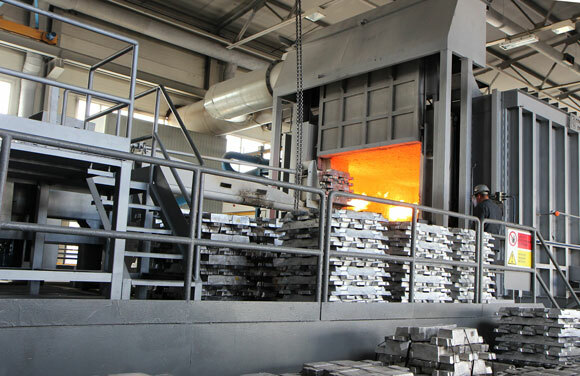 With aluminum, that has not always been as clear, since more metal is held off exchange by the stock and finance trade than is held on the major LME, CME and SHFE markets. In the early part of the decade, some analysts simply ignored these numbers on the basis they couldn’t estimate with any degree of accuracy what was happening to these shadow stocks, and believing they were locked up for the long term (making their presence almost irrelevant). This publication never took that view and has always tried to bring an estimate of off-exchange market inventory movements into our estimates. At its peak, these massive stocks approached 10 million tons, while LME stocks hit a peak of some 4.5 millions tons. However, since 2016 both have fallen quite rapidly, such that today CRU estimates off-warrant stock at some 6 million tons and the LME, when metal awaiting load-out is stripped out, falls below 1 million tons, according to Reuters. Nothing illustrates the deficit condition of the aluminum industry outside of China more powerfully than those figures. Over 1.5 million tons per annum has been absorbed on average into the market over the last three years — and the rate has been rising. 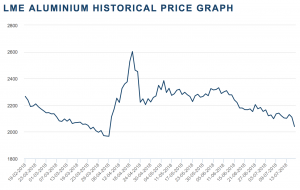 As the remaining metal is held by fewer parties, distortions are beginning to appear in market pinch points, specific pricing points used by the LME market to roll over positions, such as the third Wednesday of the month. 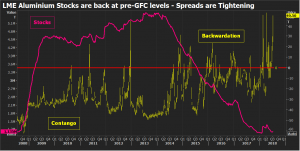 This graph from Reuters illustrates the spike in spot or cash prices over three months, a condition called backwardation that is illustrative of a market under stress. The frequency the market slips into backwardation has been increasing, with three spikes this year alone. A market in deficit is unlikely to exhibit bear pricing for long, current apparent weakness is more a factor of short-term dollar strength and anxiety over trade conflicts.